$399 Seen a lower price? The M-Audio Hammer 88 Keyboard Controller is a premium, no-compromise keyboard controller, ideal for professional, semi-pro players or students seeking the realistic grand piano feel to use with virtual instruments or sound modules. At the heart of Hammer 88 are 88 velocity-sensitive, fully-weighted hammer-action keys that are guaranteed to faithfully capture every subtle nuance of your performance, while providing the unmatched response of a traditional grand piano-classic feel fused with the unrivalled sonic capabilities of virtual instruments. It's the perfect combination for performers and producers to experience their plugin collection like never before. Put expression center-stage with Hammer 88, thanks to a core range of controls, thoughtfully positioned to complement and enhance your performance. With a unity-locking pitch wheel and a separate modulation wheel, add portamento and glissando effects, or map the Mod-Wheel to any assignable parameter in your virtual instrument collection to reshape and evolve your sound on the fly. With the dedicated Master Volume Fader, you can instantly control the intensity of your performance or MIDI map this to any compatible parameter in your DAW or virtual instrument collection for expanded, hands-on control. Use the assignable Up and Down buttons to select different programs, effects, MMC messages, jump between octaves and more. Add some pedal-based performance articulation using the three dedicated inputs for Sustain, Expression and Soft. With Hammer 88's performance-centric feature-set, expressing yourself has never been so easy! Don't limit yourself to your computer-based virtual instruments! Take control of your studio equipment with Hammer 88. 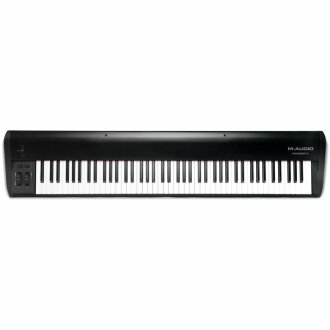 With its conveniently-located 5-pin MIDI Output, you can send all MIDI information to any compatible peripheral device, including hardware synthesisers, sound modules and drum machines. With Hammer 88, it's easy get the most out of your external sound generators. This is a controller designed from the ground up to place you firmly in the driver's seat. An instrument shouldn't limit your creativity, it should enhance it! Hammer 88 is USB-powered, class-compliant and supports USB-MIDI connectivity for rapid, hassle-free setup that lets you focus on what's important - your performance. Plus for iOS enthusiasts, Hammer 88 supports seamless connectivity with the Apple iPad Camera Connection Kit (sold separately), enabling you to perform and compose with audio apps on your iPad and other iOS devices. Same Day Music is an authorized dealer of M-Audio products. - Dimensions: 11.9" x 5.0 x 55.9"